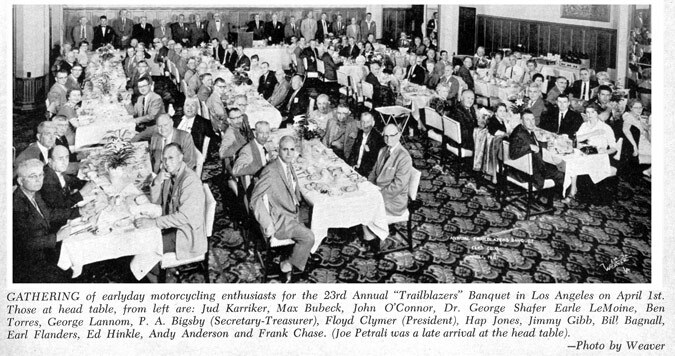 Mar 6, 1940: We were the "Old Timers"
Above is the very first Trailblazers' banquet held March 6, 1940. The date is certain because the room conforms to the small picture on page 22 of the March, 1940, "Motorcyclist" magazine. The affair was held at the T. V. G. Hall in Los Angeles (no, I don't know what TVG stands for). At this banquet, the following statistics applied: One man rode before 1900. Seven men started in the period 1900 to 1905. Sixy-six men started in the period between 1905 and 1910. Fifty-five men started in the period between 1910 and 1915. Twenty-five me started in the period between 1915 and 1920. Paul Derkum was elected president and A.F. Van Order was elected secretary and treasurer. The picture was taken by TrailBlazer Hall of Famer, Kenny Scholfield, who was quite a short track (called "speedway" today) rider. The caption reads: "5th Annual Dinner of Trail Blazers, Rossslyn Hotel, LA"
The caption reads: "7th Annual Trailblazers Banquet, Rosslyn Hotel, Los Angeles, March 16, 1946"
When Van Order passed away in November, 1954, publisher and former racer Floyd Clymer picked up the gavel, schedualling meetings in Los Angeles area banquet facilities. The 1960 TB banquet was March 19 at the Elks Club, LA. Caption said: "28th Annual Banquet, the Trail Blazers, Elks Club, Los Angeles, April 3, 1965"
After Floyd's death in 1970, the annual gatherings were in limbo for several years until they were reactivated by Max Bubeck and Earl Flanders. Eventually, publisher Bill Bagnall, editor of Motorcyclist magazine, took the helm and presided over the club activities for many years. Recently, the TrailBlazers became affiliated with the Motorcycle Industry Council, the industry's major trade organization. Recently, too, the words Trail Blazers became merged together into TrailBlazers.